What is the Transbay Program? Transit Center: Replacing the former Transbay Terminal at First and Mission streets with the new Transit Center, stretching just south of Mission Street from about Second to Beale Streets. Downtown Extension (DTX): Extending Caltrain 1.3 miles underground from its current terminus at 4th and King streets into the new downtown Transit Center and designing the rail system to accommodate California’s High-Speed Rail from San Francisco to Los Angeles/Anaheim. Transit Center District: Creating a new neighborhood with homes, offices, parks, and shops surrounding the new Transit Center. Why do we need the Transbay Program? It is time for public infrastructure to meet the needs of the 21st century. The Transbay Transit Center Program will centralize a fractured regional transportation network — making transit connections between all points in the Bay Area fast and convenient. The new Transit Center will make public transit a convenient option, as it is in other world-class cities, allowing people to travel and commute without the need for a car, decreasing congestion and pollution. The Transit Center will provide a downtown hub in the heart of a new transit-friendly neighborhood with new homes, offices, parks, and shops literally steps from the doorsteps of area residents. When will I be able to use the Transit Center? The new Transit Center opened on August 11, 2018. It is used by Muni, AC Transit, and other regional buses, operating in an outstanding facility with well designed public spaces and a variety of retail. The underground rail extension for the Caltrain rail line and future California High-Speed Rail is environmentally cleared and the timing of construction will depend on funding availability. What is the schedule for construction of the Transbay Program? The Transbay Program will be constructed in two phases. The first phase includes construction of the above-ground portion of the new Transit Center, the below-grade rail levels in the Transit Center (the “Train Box”), and the bus ramp connecting the Transit Center to the San Francisco-Oakland Bay Bridge. The first phase of the Program is complete and the second phase of the Program includes construction of the Downtown Rail Extension. The second phase of the Program will begin construction based on the availability of full funding. How many people will use the Transbay Program facilities? At the completion of the Program, the Transit Center will accommodate more than 100,000 passengers each weekday and up to 45 million people per year. We estimate that there will be about 33,000 Caltrain rail trips to the Transbay Transit Center from the Peninsula each weekday. The California High-Speed Rail Authority estimates that its system is expected to transport up to 32 million intercity passengers annually and another 10 million commuters. How many new jobs will the Transbay Program create? The Program will create an estimated 125,000 jobs, directly and indirectly, including approximately 8,300 construction jobs and 27,000 permanent jobs once the Transit Center is complete. It will open up a significant number of employment opportunities for people that live in San Francisco and along the Peninsula corridor. How much will the Transbay Program cost and how is it funded? The entire Transbay Program costs are estimated at about $6 billion, escalated to the year of expenditure (YOE). The Program construction is funded by a variety of federal, state, regional, and local sources. The Program is funded, in part, by a $400 million ARRA grant, a $171 million TIFIA loan, land sales, bridge toll funds, regional measures, local sales tax, a special Mello-Roos tax district. 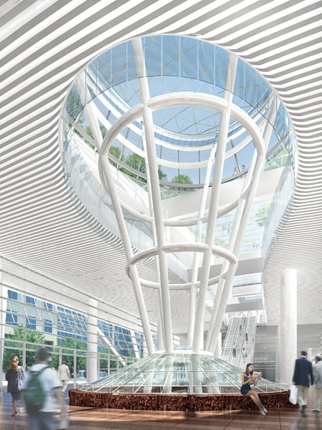 Who designed the Transbay Transit Center? The Transbay Joint Powers Authority (TJPA) has primary jurisdiction with respect to all matters concerning the financing, design, development, construction, and operation of the Transbay Program. The TJPA is a joint exercise of powers authority created by the City and County of San Francisco, the Alameda-Contra Costa Transit District, the Peninsula Corridor Joint Powers Board, the California High Speed Rail Authority, and Caltrans (ex officio). The TJPA is managed by TJPA staff and is overseen by its eight-member Board of Directors.